• The secret of Chia is out and is here to stay, but WE has taken is one step further by combining Organic Chia Seeds & Flaxseed all-in-one, to give you a DUAL natural source of Omega-3. • Is a unique combination of organic Flaxseed plus chia seeds to give you a rich dual source of omega-3 and omega-6,along with fibre and protein plus calcium for energy-yielding metabolism. • High in fibre, calcium, complete protein, amino acids, slowly processed carbohydrates and loaded with vitamins, minerals, and omega-3. • Chia & Flaxseed can be added to any meal, cereal, yoghurt, smoothie, juice or baking to fortify your meal with Omega-3, protein & fibre. 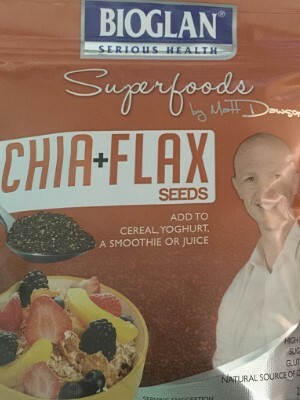 • Chia & Flax seeds are two of nature’s finest Superfoods – they are the richest plant based source of omega-3, protein, dietary fibre and antioxidants and they provide a great tasting source of protein & fibre. • Chia & Flax seed is gluten free, trans-fat free, sugar free, non GMA and pesticide free.